Our NMI Capstone team partnered with College Factory, an Athens-based nonprofit that works to build a college-going culture in the community, to both update their online presence and bring their curriculum into the 21st century. We did this by recreating CollegeFactory.org using a WordPress framework, which allows for clean design and simple content updates, and migrating the organization’s offline curriculum into a Google Classroom, which allows both students and mentors easy access to the College Factory Go Succeed program. 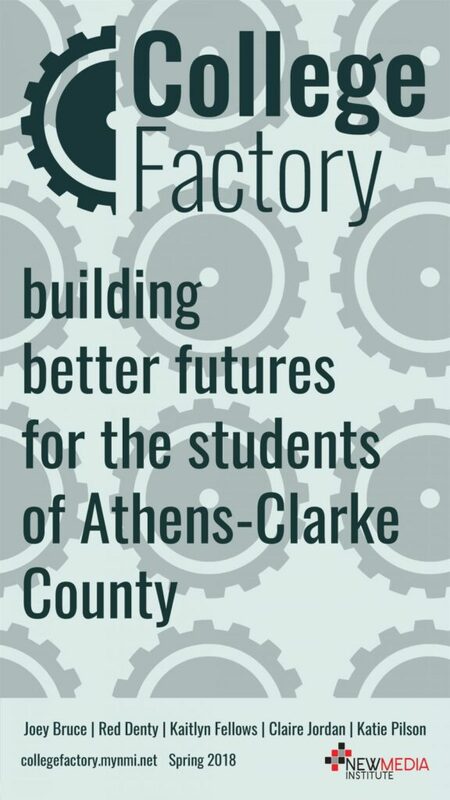 College Factory is a 501(c)(3) certified nonprofit based in Athens, Georgia, dedicated to helping first-generation college students achieve their post-secondary goals. By pairing high school students with post-secondary mentors, hosting community workshops and providing low-cost ACT training, College Factory works to build a college-going culture in the Athens-Clarke County community. Composed of a network of educators and volunteers, College Factory is committed to helping students find the right path along their journey to college.